It's Wednesday. You know what that means. Yes, it's "hump day," and by lunch-time your work week will be half over. But, it's also What I Ate Wednesday! I look forward to seeing what everybody ate this week, when I link up with the other girls over at Peas & Crayons. I am sharing some highlights from my eats over the past week, starting with a special treat. 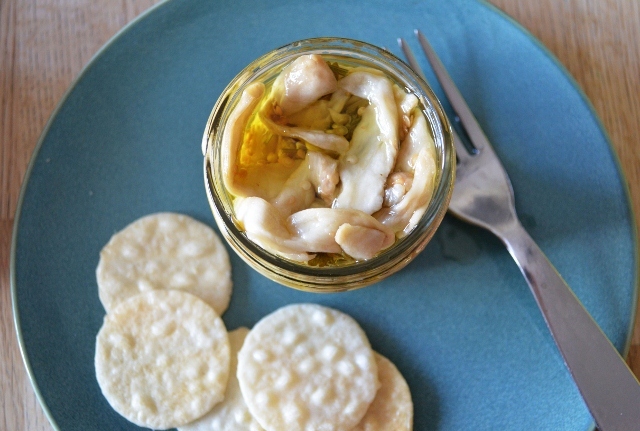 My mother-in-law gave us six jars of her homemade marinated eggplant last week, so my Saturday lunch included almost a whole jar, served on rice crackers. It was delicious. I was going to make some myself, but now I don't have to! I did, however, make a curried chickpea dinner on Saturday night. This is an old favourite of mine, and I will be sure to share the recipe soon. On this particular occasion, I used a new chili powder. I didn't realize how hot it was. I don't like my food super hot, and it kind of ruined the curry for me. My husband and son like the heat, so they were okay with it. Our local health food store had a customer appreciation event on Saturday, and they were giving out samples of this granola. They had a few varieties, but I was drawn to the dark chocolate chunks in this one. 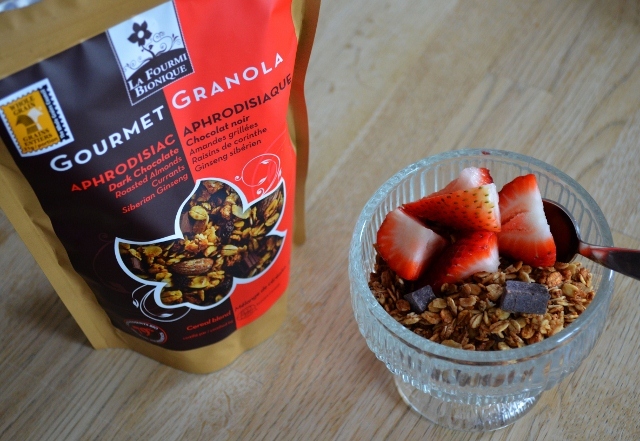 This "Gourmet Granola" is made by La Fourmi Bionique in Quebec. It was on sale for $3.99. 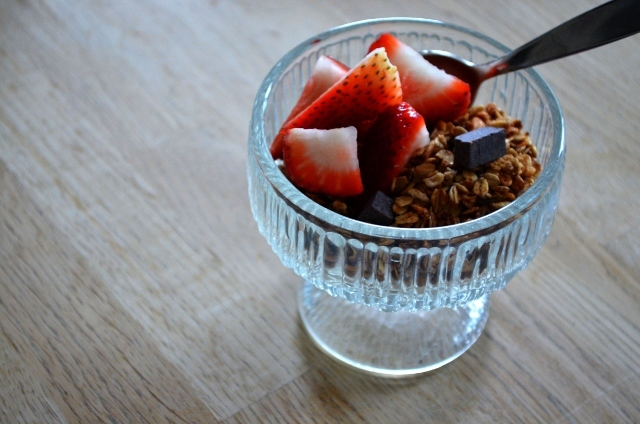 I served it for my Sunday breakfast with strawberries and soy milk. 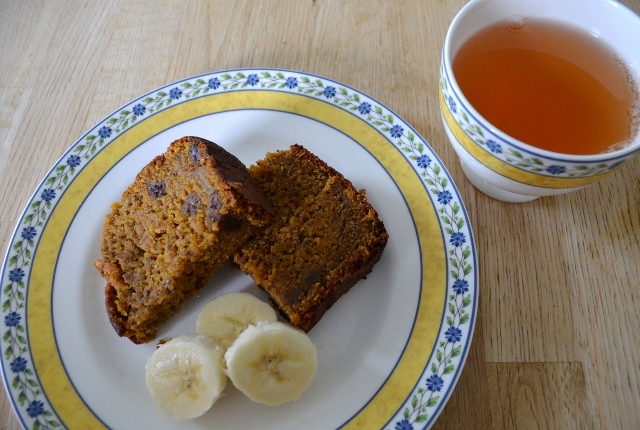 Sunday breakfast, part two, was a couple of chunks of pumpkin banana date loaf. Recipe here. I keep buying those big organic salad mixes, and we rarely use the whole package. So, on Monday, I forced myself to make a big salad for my lunch. 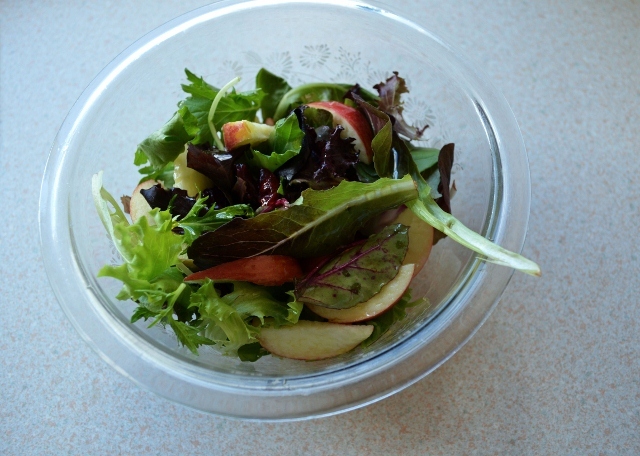 I topped the greens with apple slices from our apple picking trip, along with dried cranberries and an olive oil vinaigrette. I also had some tortilla chips and salsa. Now that the kids are starting back into their sports activities, and the evenings are busy, I sometimes serve their dinner right after school, at 3:30. They used to come home really hungry and have huge snacks, and then pick at their dinners. Dinner after school works well, because they are so hungry they will eat more "good stuff." I usually end up eating a bit with them. 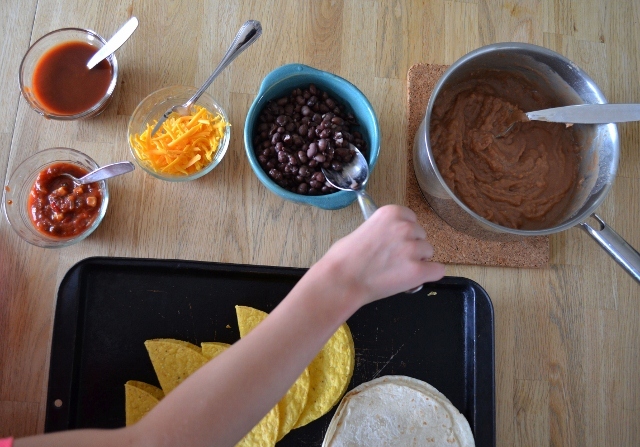 On Monday, we had tacos with refried beans, black beans, salsa, taco sauce and (the kids had) cheese. 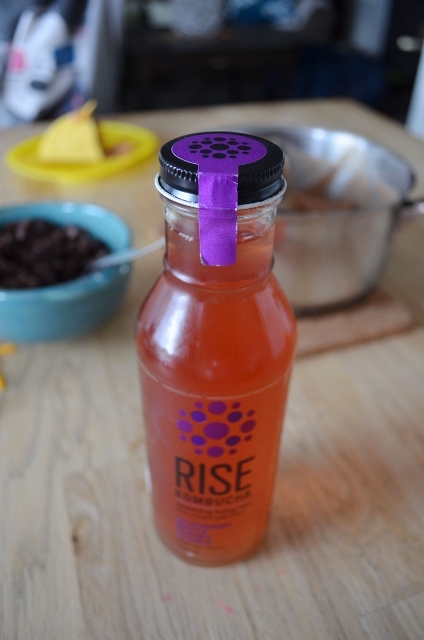 The kids and I also shared this maple and blueberry flavoured kombucha, which we had sampled at the health food store. My daughter chose the flavour and I didn't really like it. Since I don't drink milk, I have been searching for something to add to my very occasional cup of decaf coffee or tea. (Usually I drink decaf green tea and don't need anything added.) On Monday morning, I had a decaf coffee with So Delicious dairy-free coconut milk for coffee. I didn't notice any distinctive taste (like the soy coffee creamers have) so I will probably make this my regular coffee add-in. 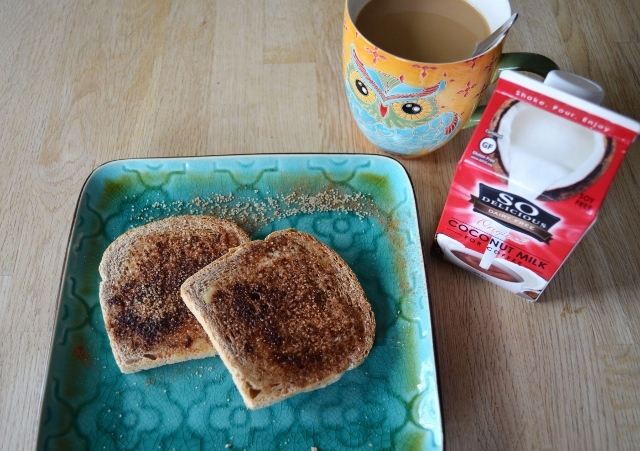 On my toast, I had some Earth Balance spread with a cinnamon/sugar mixture on top. I don't usually have that for breakfast, but I felt like having something besides my usual peanut butter. My mom introduced me to the cinnamon/sugar mix as a child, and I usually only have it now as a treat in the evenings. 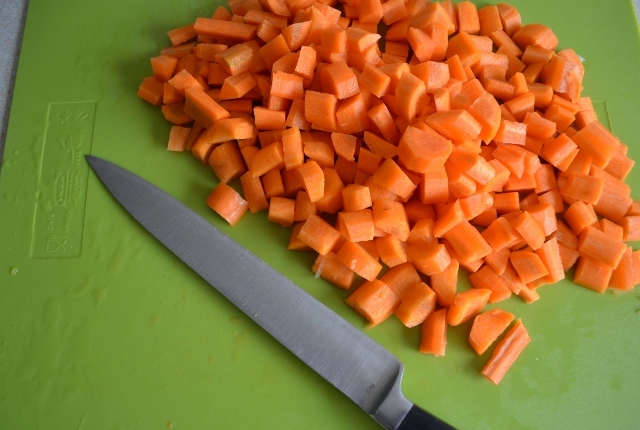 Yesterday, my sister-in-law dropped by for a visit, so I made us a quick lunch of carrot soup. 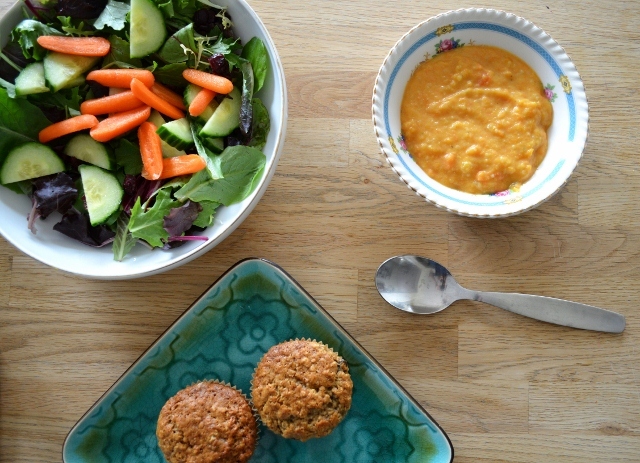 I also made our favourite banana chocolate chip muffins and a green salad. The soup was simple and tasty. It's always fun to learn about new products- anything with dark chocolate chunks sounds good to me. :) Your chickpea curry looks awesome, too! 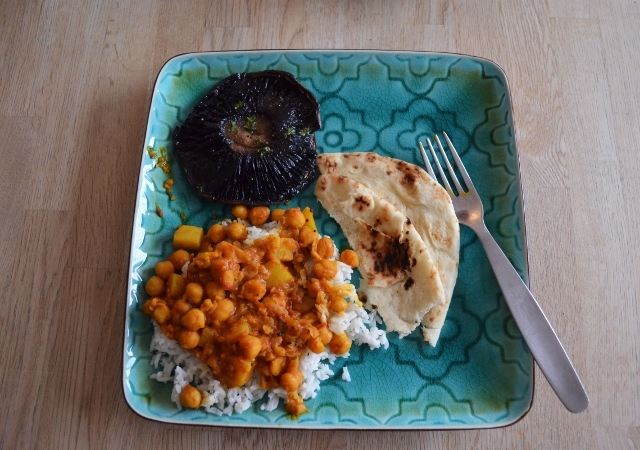 The eggplant looks so great, and curried chickpeas are one of my favorites! Yes, the eggplant is yummy, and I can't wait to make the chickpeas again without the heat. Now I am hungry. Everything looks so good! Thanks! I am (always) hungry too! A delicious week! That marinated eggplant sounds great, I've never tried it before. It is scrumptious. I think I will try making it when it runs out! I would have liked some granola today, but my daughter ate it up!